Meeting and Event PlanningEliminate The Muda! The first really big (aka expensive) dinner I have ever purchased was shortly after starting a new job. It was an evening spent gorging on sushi at one of only two restaurants we could find in Dayton Ohio. The hotel made us reservations for the restaurant on the north side of town but our drivers took us south. Maybe it was the other way around? 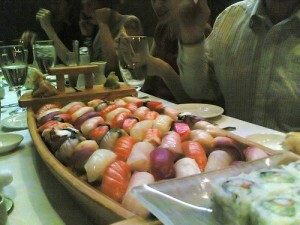 The meal included several boats loaded with sushi and a large number of special orders. Unfortunately, it was also one of those nights that included sake and karaoke. As the evening ended my boss picked up the tab and opened the folder. After a brief glance he handed it to me. The bill was for a little over $1,800. My credit card jumped from my wallet and tried to fly away in fear, it had never seen such a charge in its life! Twenty-two of us ate for $81 a piece. In retrospect, at a per person rate, I have seen much worse; I just never paid the bill! All this may be changing soon; I was “elected” to host a training event for a group of 40-50 people. While some companies have lavish meetings in resort locations arranged, scheduled and managed by a series of meeting and events planning vendors, I have me. Yikes! I’ve never done anything like this before so this will prove to be a learning experience for sure! We I will be hosting a dinner one night of the event. Tonight I had the pleasure of trying our my first choice based on a carefully selected list of possibilities chosen by Alex. Who is Alex, you ask? Why, Alex is my new best friend and doorman at the Hotel we I have chosen for the event. I arrived at Alex’s prime choice, a steakhouse. After a few complications I found myself eating at the bar very near to the entrance with a perfect view of the dining room. If I were the General Manager, this is the last place I would allow a customer to sit, not to mention customers that are thinking of bringing 50 other people on their next visit! I saw every error committed throughout my 2-hour ordeal. The food was better than many comparable restaurants, but it took an inordinate time to prepare the meal. Glasses piled up, drink orders were delayed, guests were paraded back and forth between dining rooms in search of adequate seating. Some tables seemed to enjoy frequent service with others, like me, sat waiting. Sitting at the bar also gave me the chance to watch and listen to a number of the associates. While some servers gracefully presented the menu choices and refilled glasses, others were nearly running in an effort to keep up with the chaos. Three associates were captured to haul armfuls of Bud Light to the meeting room. One young, and obviously inexperienced bartender popped in briefly. While he took the initiative to 5S the area first, he wasn’t able to finish as a manager came by to redirect him to serve the function in the meeting room. A column stood in the bartender’s path. You couldn’t reach the entire wall of liquor from either side. I watched the man squeeze past dozens of times has he reached for bottles. Cases of booze were piled along the wall. Empty boxes were stacked next to the door. Glasses of every conceivable size and shape were hung and stacked on a variety of shelves. If there was any organization, I didn’t see it. I asked the bartender if there was a trick to finding the right bottle. Most common scotches, rum, and vodkas were grouped together and lined on a series of mirror backed glass shelves that rose to the ceiling. The entire bottom row however contained the less common drinks stacked 3 bottles deep. He admitted that anything on this shelf would require a hunt; “you never know where you will find it.” he said. I couldn’t help but wonder why he would reach and climb for his common drinks while ones he rarely uses are within hand’s reach? Shouldn’t these be switched? Decent bathrooms are also a requirement for a group dinner. This restaurant nearly passed with flying colors. It would have made even the germaphobic comfortable, complete with custom printed luxury paper towels. They may not be green but they were the nicest disposable you will find. While eating I inquired about group arrangements. Not much later I received a folder with their banquet sales material. Our group can use one of only two rooms. Room A is rated for 40 people at a cost of $3,000. Room B is rated for 80 people at a cost of $2,500. No, it is not a typo, the smaller room cost more than the larger room. This restaurant intends to charge as much as $75 per person for the pleasure of having 40-50 people spend another boatload of money on the food they serve! I completely understand that they may have additional costs to cover when handling large parties, but $75? In case you are interested; hors d’oevres run $2-$17. Entrees are preselected for large groups with pricing ranging from $43.95 to $79.95. Each of these does come with a salad, a starch and a dessert. The scary part is that there are no prices for alcohol in the materials. Why would they only give you 80% of their price list? Are they trying to make me work hard to give them more money? Put it all together and add alcohol and the cost may easily surpass $200 per person. This restaurant might be on the top of Alex’s list, but it is not on mine. Based on my experience tonight, I can only hope I will find another place in the next 48 hours. After years of counting pennies, living frugally and sacrificing our dining routine, I find this project ironic. We strive personally to save yet so many of us will go out and throw down crazy money in the interest of business. How does it make sense to be frugal with my personal money but it not make sense when I am using someone Else’s? Readers: Do you think my boss or my customers would be happy if I gave them a frugal training event? Do you find these prices enlightening? What is the most, per person, you have ever spent on a dining experience. If you have any experience booking large groups? I’m open to any tips or suggestions you have! I just came across this note via a Twitter link. My suggestion first and foremost is get a solid budget (don’t go over) amount from your boss. That way you’ll have an easier time splitting up the cost between food and beverage & location. You’ll almost always find the boss has a figure in his/her head that they haven’t shared with anyone. Many times if you hold the dinner at the same place the training is taking place (like a hotel) they will comp you the cost of the room since you have hotel rooms booked and will be ordering F&B. I hope this helps. Wow, that is a lot of money for sushi!! I recently traveled for work and they gave me a stipend before I left for food. It was pretty neat. 🙂 Of course, I liked it better when I had an allowance and could use my company credit card. Hmmm, I’m pretty frugal, so I haven’t spent too much ever. I think once when I was first dating my now wife, I spend 40ish each. And that was at least 13 years ago. Even though it a business expense, if I saw those numbers, it would almost make me ill. Sounds like quite the experience! Good Luck!!! @Maureen – Your advice has been put to good use. I have already obtained some concessions from the hotel. Unfortunately I am still batting zero on the restaurant for our dinner. Choice 2 was perfect but they cannot accomodate our dates. @Mrs. Money – I’d love to just give everyone a gift card and let them find their own dinner but but we usually try to pull participants together so that they can mingle and talk. @Money Reasons – I wish I could say the same. Personally we have spent a small fortune on restaurants. Though it is very rare we still splurge. Someday, you are going to have to do the same! Oh, little grasshoppa….you have so much to learn. I used to do event planning….and the prices they quoted you are so far inflated, I have no idea how they didn’t fly away. Mysti – Thank you so much for the offer. We are now well into the process and have already committed to a selection of hotels and restaurants for the event. You are right, the more we looked the better options we found. DIY'ing is Illegal! « Eliminate The Muda!